However, there is something even less expected: these are full four-doors Qt fridges. I dare to say, except for cars or airplanes with infotainment modules, for me these cooling monsters are one of the biggest 'Qt devices' available on the consumer market. Read on for some hot details. So I have opportunity to work on the third generation of the fridge. The first was WiFi-enabled SRT746AWTN, which at software level is even marketed by Nokia as a customer story. Then this year appeared (already quite popular) RF4289x, announced at CES (video). 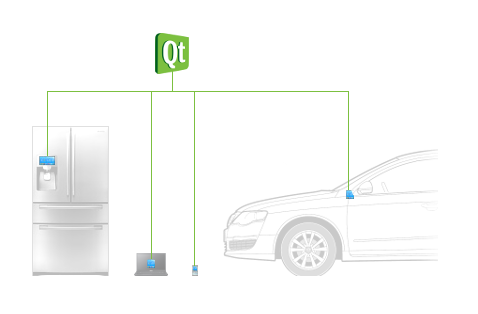 Technically, the fridge itself is an intelligent black box for us, developers. What developers do really deal with is the a Linux embedded device with 8" LCD Screen touch screen capable to control the box and handle quite a few apps. So far following custom Qt apps are included: Memo, Recipes, Picasa Photos, Weather viewer, Organizer, News, Internet Radio, Twitter. "Why do I need another device with apps in my home when we all own smartphones?" you would ask. Let's note that the device would be the only one in your home that is always-on, and maintenance-free (no geeks assistance needed). As such, its Calendar/Organizer app should be useful for sharing appointments in a traditional way but geeky style. And with screen of a tablet size rather than smartphone. What extra uses would you like to see for this high-end device? How about a full SDK and App Store? Let's hear about it in the comments. I'd like an app to manage the fridge content: the app should display the current content (input from bar codes and mobile tags -> needs a camera and manual input to create the list). Then make a list of stuff to buy from content management. Scanning barcode or mobile tag can also indicate best location to buy this. Ultimate dream: you take your last bottle of orange juice from your fridge, you scan the barcode, the app offers to add it to your online shop! Recipes based on your fridge content. Not sure if my husband is ready to buy me such a fridge with a touch screen! When I enthusiastically mentioned this fridge this morning during breakfast, he looked a bit like "well if she has such a tool in the kitchen, for sure diner will never be ready!" Thanks for the feedback, annma! The automated shopping with barcodes or RFIDs is indeed frequently suggested idea. Recipes based on your fridge content - my favourite! As for TV, it would be good for kitchen indeed if it wouldn't generate too much hot, imagine the implications... for the same reason such devices use efficient enough but underclocked CPU. 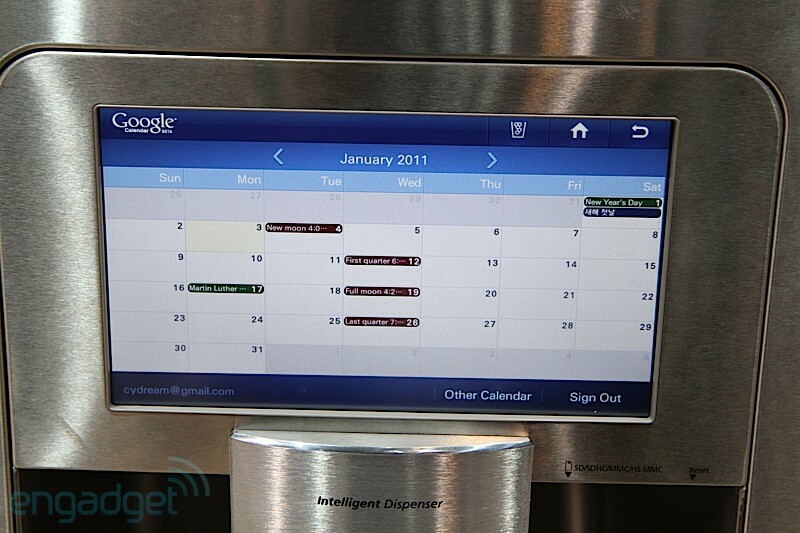 PS: stay tuned, the fridge supports software/firmware update! The simple computer provides a way for the co. to distinguish its products from competitors' products. The applications included are about right - calendar, recipe, memo. I would NOT flood the interface with too many applications; that would be counter productive. 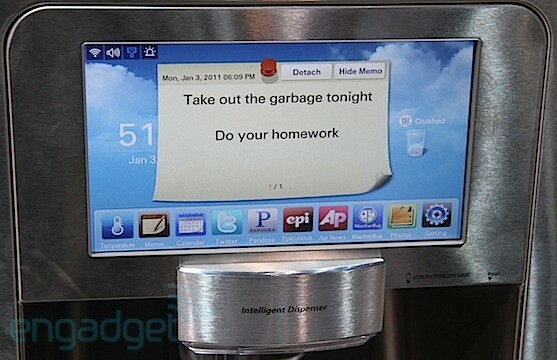 People who use the refrigerator will not toy with it as a computer, period. The interface should be simple and easy to use. And inuitive. The controls to the refrigerator can be built in ( as they probably are). I was, however, disappointed to observe, in the samsung lab photo, that all the desktops shown were windows. I was hoping to see more linux use in Poland. OK, seriously, they use multiple Windows/Linux machines and share their displays between them; typical case in the industry. And as for the Linux usage in Poland - let's not extrapolate, Linux is reasonably popular here, and the country leads in the Firefox vs MSIE wrestling in the region (http://webhosting.pl/files/groups/editors/software/2008_09/wykres1.jpg).